Philip Addo was born in Accra on February 24th, 1982. He had his basic education at the Gyemmah Preparatory School and Lartebiokorshie Presby Junior Secondary School, both in Accra. After, he furthered to Accra Academy for his senior secondary school education. He has a diploma in Airline Ticketing and Reservation from the International School of Aviation, Tema. 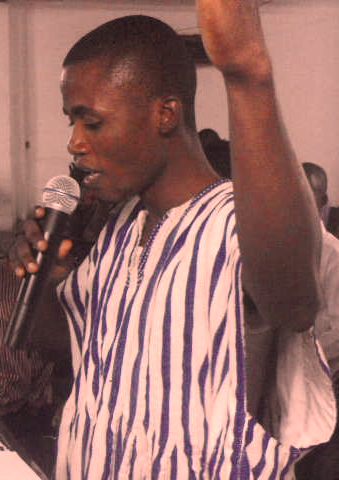 Currently, he is pursuing a degree course in English Language education at the University of Education, Winneba. Philip writes all kinds of literary works. He loves to preach peaceful co-existence and love for one another. 1. A text message to a friend who has died is, needless to say, an unexpected form of elegy. What inspired you to take this route? The poem is a grief song in an invisible text message to the world of our ancestors, to whisper to them that their fight against the slave trade and colonialism has been a waste of time and a needless loss of precious lives. My inspiration came from the pain of seeing people, especially highly educated Africans, struggle to steal out of their countries only to be serfs elsewhere when The Great One has endowed us with all the natural resources we need. To add to the above is the pain they go through before traveling: joining long queues at embassies; traveling long distances on deserts; paying huge amount of monies to individuals as bribes etc. Therefore, the persona’s cry in this poem is simple; to bring to light a naked truth: the slave trade still exists but the chains are now invisibly in the mind. 2. This poem has a number of biblical overtones. Do you consider it to be a religious poem? Critics may look at the poem from different perspective, but personally, I do not consider the poem a religious one. Jake in the poem alludes to all dead people who were against the slave trade and colonialism. They have fought for their motherland and they died a death of pride. However, the people who they laid down their lives for are now embracing a well- packaged slave trade in the form of visa lotteries and other decorated lies. 3. Your poems are often feature a great deal of rhyme and repetition (though there is no repetition in this poem). What draws you to these devices? Do your favourite poems by others use these devices? Though some of my favourite poems use these devices, I use mine depending on what I want to achieve in the poem. 4. How is your schooling going at Winneba? Is it everything you hoped it would be? Is there anything about the course that is surprising you? I am now on my out-segment (internship). Studies on campus was great though a little bit stressful. Academically, the experience has been much rewarding. 5. You've made a move from working in the airline industry to training to teach English. Have you noticed any skills that you developed in the airline industry that are transferable to English education, or is it like starting all over? I don’t think the skills I acquired at the aviation school are total wastes. For example, my Salesmanship and Communication Skills at the aviation school are really complimenting my English Language course.